Like carpal tunnel syndrome but affecting the eyes, Computer Vision Syndrome is a repetitive motion injury. Watching a video, reading a screen of text, or looking up and down between papers on your desk and your screen requires significant effort from your eye muscles. As you engage with your screen, your eyes follow the same path over and over, adjusting again and again. The longer you spend behind the screen, the harder your eyes must work. When your eyes grow fatigued because of this repetitive motion, you may begin to experience symptoms such as eye pain, irritation, redness or dryness. You may also notice blurred or double vision. And you may find your eyes aren’t the only thing affected: headaches, neck pain and back pain are also common symptoms. Who is at risk for Digital Eye Strain? Not everyone who uses screens will experience vision trouble, but it’s more common than you may think. Studies have shown that between 50% and 90% of people who use a computer for work experience symptoms. Those with any history of eye trouble are at higher risk, as are those who need glasses but don’t have them, have glasses but don’t wear them, or are wearing the wrong prescription for computer use. Computer Vision Syndrome isn’t reserved for those who spend eight hours a day behind a screen. Children are susceptible, too. Kids who stare at screens for even a portion of the day may experience Computer Vision Syndrome symptoms, especially if lighting and posture are poor. What should I do if I think I have Computer Vision Syndrome? Pay attention to your eyes. If they hurt, feel strained, or your vision is blurry during screen time, try to blink often to moisten them. You may also consider eye drops for dryness. Try the 20/20/20 rule: Every 20 minutes, look away from your screen, focus on something around 20 feet away, and keep your gaze there for about 20 seconds. Adjust your lighting to reduce screen glare as much as possible or add a glare filter on your monitor. Don’t hesitate to tweak your screen brightness, contrast, and font size so your eyes are as comfortable as possible. Ask about eyewear designed especially for computer use to ensure that you are seeing your best when viewing a screen or device. Studies suggest that exposure to blue light from digital devices can be harmful to your eye health and sleep patterns as well. Special blue light filters are available for most lens options today. Watch your posture. You don’t want to have to lean forward, hunch down, or stretch your neck to see your screen. Position your monitor slightly below eye level and about two feet away from your face. Keep papers you’re referencing at eye level by placing them on a stand next to your monitor. Visit your eye doctor regularly to ensure you’re treated for all vision problems, even minor ones. 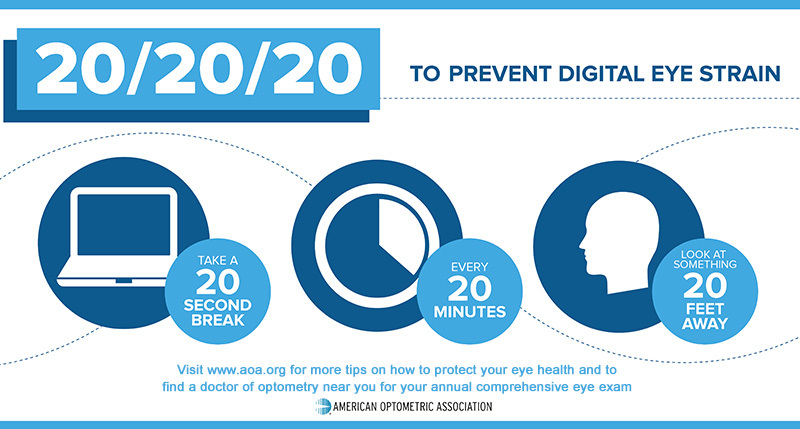 Digital eye strain is more commonly experienced by those who have a history of eye or vision issues. If you believe you are at risk for Computer Vision Syndrome, are experiencing any discomfort, pain, or strain while using your cell phone, tablet, computer or other screen, call your eye doctor and schedule an appointment to discuss your symptoms and risk factors for Computer Vision Syndrome. To determine whether you are experiencing digital eye strain, your optometrist will complete a comprehensive eye exam, which may include tests to discern how your eyes respond while working at a computer or other screened device. Your eye doctor will also consider your personal and medical history to determine whether certain elements in your environment, such as poor lighting, improper posture, glare, or certain medications, may be contributing to your symptoms. With the right support from your optometrist, Computer Vision Syndrome can be effectively treated so you can keep seeing your best!